Arturo Ortega Luna has joined the defense of the ejidatarios to prevent the construction of the dam, which would affect more than 180 hectares of ejidal lands used for agricultural purposes by Zoque indigenous people. Ecologists have denounced that “the project will deteriorate and fragment the Grijalva River, this only to satisfy the energy demand of the eastern region of Mexico.” According to a bulletin published by the CDHFBC following a press conference on “Violations of agrarian rights and the judicialization of those affected by the Chicoasén II dam” on 27 October, “the ejidatarios affected by the Chicoasén dam have carried out various peaceful and legitimate actions to avoid the progression of the construction of the hydroelectric project that would affect their lands.” On 9 October, the ejidatarios won a legal motion before the Collegiate Tribunal that demanded the suspension of the existing construction plan, though this ruling has gone ignored to date. 52 individual legal motions in process remain pending, and all involve the detained lawyer. The CDHFBC has held that his arrest “is an act of criminalization and harassment that corresponds to his actions in defense of the lands amidst looting […] which if carried out would imply the displacement of dozens of families.” The ejidatarios are confronting harassment due to their defense of their agrarian rights, though there exist formal agreements that were signed in July 2015 whereby the Chiapas state government committed itself to not prosecute those who defend their agrarian rights. Since 10 November, relatives of Florentino Gómez Girón (who has been held in the no. 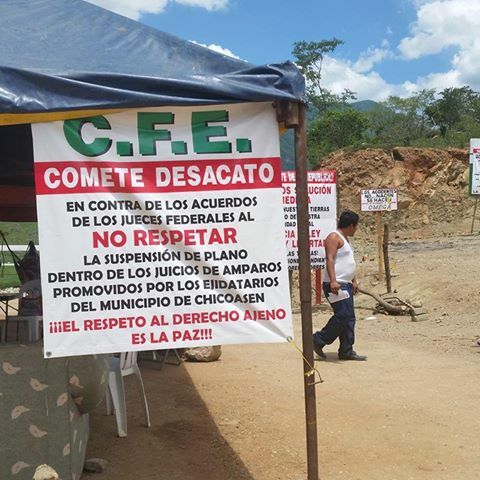 14 prison of El Amate in Cintalapa since 1 May, on the charge of robbing cattle) and members of the “Ricardo Flores Magón” Popular Front have maintained a sit-in before the Chiapas state-congress in Tuxtla Gutiérrez to demand the release of Gómez Girón. Some days later, after having denounced “governmental indifference” and suffered police harassment and the threat of displacement using public force, those who comprised the sit-in began a hunger strike, sutured their lips, and participated in a mock crucifixion before the congress. Filemón Gómez reported that the health of seven of the ten hunger strikes has declined, adding that they are presenting fluctuations in blood pressure, weakness of the extremities, nausea, dizziness, risk of infection, and gangrenous symptoms due to the sutures. In this way, she added that protestors had had no contact with state authorities to address the case. 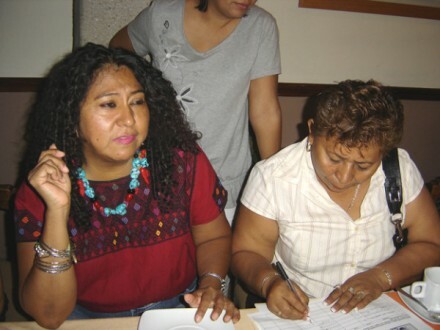 Juana Gómez, daughter to Florentino, mentioned that her father was arrested in Tuxtla Gutiérrez after a teachers’ march by two persons dressed in civilian clothes. He was neither accused of any crime nor provided any evidence of having done so, and to date, no convincing evidence implicating Florentino Gómez has been revealed. Furthermore, she affirmed that he was targeted for his political activism. 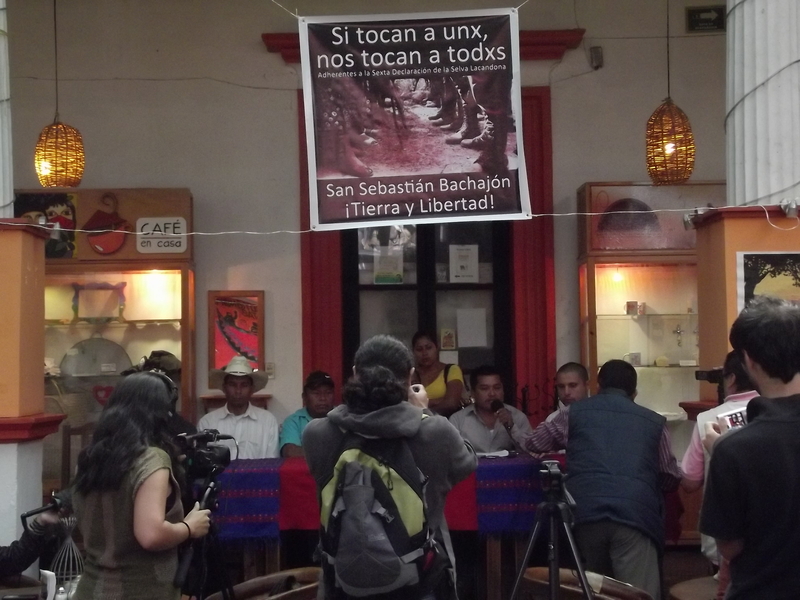 On 16 September, three indigenous persons from the Virgen de Dolores community located within the San Sebastián Bachajón ejido were arrested by municipal police of Chilón, being adherents to the EZLN’s Sixth Declaration of the Lacandona Jungle. Those arrested denounced having suffered torture and cruel and inhumane treatment toward the end of having them confess under compulsion to the crimes with which they had been charged. The indigenous persons of Bachajón indicated that the operation was a revenge attack, given that one of the police who arrested the three Tseltales is a close friend of Sebastián Méndez Hernández, who is imprisoned in the El Amate jail for having participated in the murder of the indigenous man Juan Carlos Gómez Silvano on 21 March 2014. On this occasion, the residents of Virgen de Dolores captured the murderous police officer and handed him over to the authorities, such that they claim that this fabrication of crimes (torture and kidnapping) is in reality vengeance from the municipal police. Beyond this, one of the arrested is a brother to Juan Carlos Gómez Silvano. In the end, a judge from Ocosingo assigned a bail of 300,000 pesos to each of the detainees. This is an amount that is impossible to cover, given the economic situation of those arrested. On 15 August, federal and municipal police arrested Adela Gómez Martínez and her partner Noé Hernández Caballero without presenting any arrest-order at all. The two now find themselves in the Center for the Social Reinsertion of the Imprisoned no. 14 (CERSS No. 14) in El Amate, Cintalapa. Lastly, AI requested an exhaustive, immediate, and impartial investigation regarding the arrest and the denunciations of abuse and death-threats to which she has been subjected in jail. 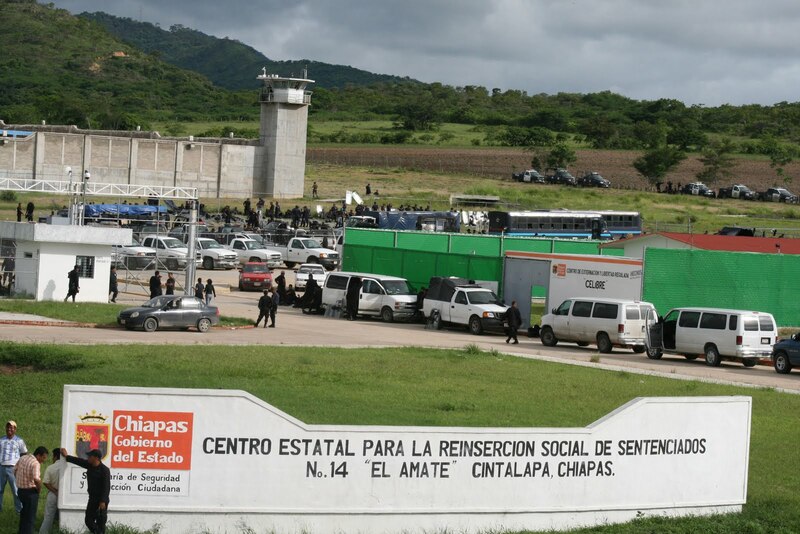 On 11 January, dozens of prisoners being held in the state prison El Amate in Cintalapa carried out a protest inside the CERSS 14 toward the end of demanding better conditions for those incarcerated there, including better quality of food, medical services, and respectful treatment of their visitors. 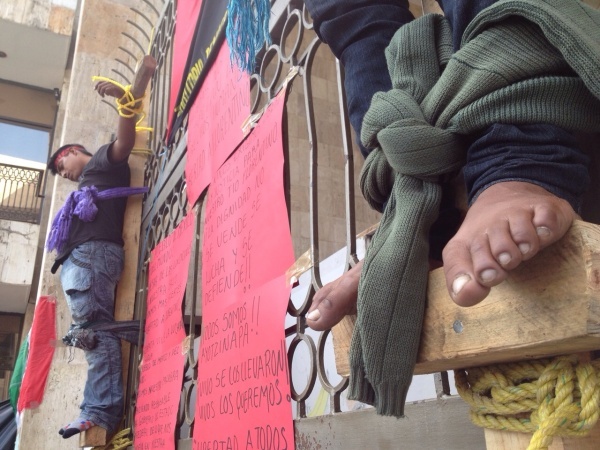 In accordance with information from the Mexican League for the Defense of Human Rights (Limeddh), all those protesting dressed in white, concentrating themselves in the “plaza” of the prison, and carried out a one-day hunger strike.